The newest Top Dawg signee will drop “Introverted Intuition” on October 18. 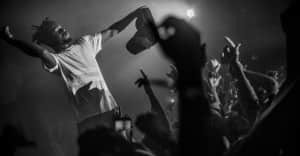 Back in May, six of the artists currently signed to L.A.'s Top Dawg Entertainment label tweeted the same mysterious message: ". @skiiiwalker ?" The tweets, which came from Kendrick Lamar, SZA, ScHoolboy Q, and others, announced the arrival of TDE's newest signee, Lance Skiiiwalker, a Chicago-based producer and singer who it appears has worked with Lamar and ScHoolboy in one capacity or another. Today, both Skiiiwalker and TDE head Anthony Tiffith announced via Twitter that the singer's debut—whether its an album or a single is unclear at the moment—will drop this Tuesday, October 18. Tiffith also took time to share the news that he ideally wants to see TDE release six albums this year and is working to get new LPs from both Ab-Soul and SZA to music fans. But for now, he just wants TDE fans to rally behind the (for now) unknown Lance Skiiiwalker.